Welcome, fans of traditional fiddling! With noted fiddler Alasdair Fraser at their helm, the San Francisco Scottish Fiddlers fill our hall (literally!) with beautiful music from the rich and enduring Scottish musical tradition. Two special performances showcase 115 members of SFSF and special guests playing contemporary pieces and ancient tunes passed down from the Highlands, Western Isles, Shetland, and Canada’s Cape Breton Island. 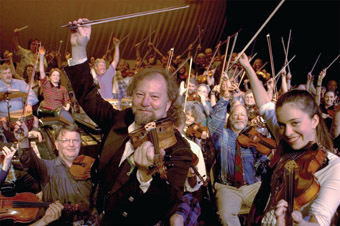 The San Francisco Scottish Fiddlers (SFSF) is a volunteer-run organization formed in 1986 under the nonprofit sponsorship of the Scottish Fiddlers of California. Members meet each month to learn and play traditional Scottish fiddle music, united by a strong sense of community and a common delight in sharing the music they love. This year in its 26th incarnation, the spring concert is one of SFSF’s most treasured annual traditions. One of Scotland's leading tradition-bearers, SFSF director Alasdair's richly expressive playing transports listeners across a broad musical landscape including haunting laments drawn from the Gaelic tradition, classically styled airs, and raucous dance tunes, all delivered with sincerity, flawless virtuosity, and the sweetest of sounds. He was inducted into the Scottish Traditional Music Hall of Fame in 2011, for his efforts to share the music of Scotland through his performances, recordings, and teaching. Please note, Alasdair presents a 30-minute talk on Scottish music before each performance, starting at 7:30pm.